“These works are etched in the contemporary mindset because of their strong connection to art history, a keen observation of current technologies, and the addition of processes that are not quite traditional but utilise new materials or methods of image production,” Staniak and McGennisken explain. To find out more about “FUTURE PROCESS,” which is at Artereal Gallery until August 29, BLOUIN ARTINFO got in touch with Michael Staniak and asked him a few questions. You have co-curated an exhibition at Artereal Gallery titled “Future Process.” What is the significance of the title and what does it reveal about the works in the exhibition? The artists in the exhibition tend to all utilise quite analogue processes, or processes that could be aligned with more traditional modes of painting and drawing, where the hand and craft take a priority. However, all of these artists have grown up with and make work during a time where technology, in particular digital technology, is often a subject or catalyst for concepts behind art and is also now commonly used as a tool during some point of the creative process. Therefore, the title “Future Process” carries with it a little irony. The word “future” implies progress, whereas much of the work on show has seen a return to traditional processes. In addition, this type of painting is seeing abstraction return to the forefront of painting today. This exhibition is mostly void of representational painting, except in the work of Nicholas Ives, whose canvases carry a narrative found in his strange figures and objects that fade into their foggy landscapes. Ives’ paintings do elude obvious description as his figures and painterly approach seem to blend in and out of focus, leaving the viewer to navigate large abstract areas of his canvases, similar to painters like Neo Rauch and Francisco Goya. The exhibition includes works by Nyah Isabel Cornish, Portland Francis, Nicholas Ives, Ryan McGennisken, Nicholas McGinnity, Dean Thompson. What is it about the work of these artists that prompted you to select their work for “Future Process”? When first discussing the premise of the exhibition, Artereal Gallery suggested that we organise it based on selected artists that have been involved with Paradise Hills over the last five years. The artists on show all have a connection to Paradise Hills, either having shown at the gallery or been a part of the studio program. The works of each artist also demonstrate great relevance to the concept behind the show “Future Process”, beyond just the association with Paradise Hills. For example, Nyah Isabel Cornish uses antiquated imagery, such as 17th Century Dutch still-life, as a starting point for her abstractions. Painting layer upon layer of oil and acrylic marks in quite an experimental manner, she reaches certain points in the painting process where she digitally photographs the canvas and uses an iPad to draw in the next element of composition on her photographs. Taking the digital drawing as another reference point, she replicates those areas of composition in a painterly manner. The resulting works are luscious, organic and multi-layered observations of a blend of traditional painting and screen-based imagery. Dean Thompson also takes his cues from the screen, but in a completely different way. He begins by searching the internet for current music countdown lists and uses the song titles from those lists as source images. His assemblages of sanded and scored gaffer tape, markers and paint on paper, allude to a kind of code or pattern that results from his interest in music and his related searches on the web. In the exhibition catalogue you state that today’s contemporary art looks to be moving away from Post-Modernism. Could you explain how this is reflected in “Future Process”? I would not say that there has been a complete shift away from Post-Modernism, but the direction in which a lot of work is heading seems to be returning to a Modernist approach. This is a process in which technology and materials are taking precedence over conceptual modes of operation. This is not to say that the works in “Future Process” are not elevated by a solid concept, or even narrative, but more so that the process or material is having a greater impact on the final outcome. Ryan McGennisken’s pieces are testament to this approach, where material and process dictates the outcome. Since moving his studio from Melbourne’s inner-city to regional Victoria, he has taken the time to source materials from his surrounding area; things such as dirt, clay, motor oil, rust and other fragments from the Castlemaine landscape. Combined with painted sections, his canvases resonate the very sense of the materials he has found around him, to the point where a viewer can smell the fresh soil if one ventures close enough to the surface. Walking through the exhibition I couldn’t help but notice that many of the works resonate with the practices of modern and contemporary masters such as Jackson Pollock, Liao Guohe, Anselm Kiefer, and Paul Klee, to name a few. Is this perhaps a reflection of the shift away from Post-Modernism? It is exactly those sort of associations with Modernist powerhouses that provides evidence of this sort of shift. You can see this return to Modernism all over the world, and with the advent of social media, the psyche of the art world shifts much faster on a global scale than ever before. One can see a great acknowledgement of these Modern masters in the works of the mysterious and anonymous collaborative group Portland Francis. With titles like Painting (AbEx 1952) and Painting (AbEx 1954), Francis salutes a period during the Mid-Twentieth Century that saw some of the most amazing explorations of paint and abstraction. His own canvases further an investigation of painting as material; combining mediums of acrylic, oil and encaustic (wax) to great effect. If today’s contemporary art is moving away from Post-Modernism, where is it heading and why do you think this is? There is no outright answer to this question. Contemporary art by nature has so many factions that it is difficult to pinpoint one direction or another. However, within painting, its trajectory has been seeing the medium dive into abstraction as the primary mode of operation. Exploring non-traditional materials or mark making that is more experimental seems to be the way of now. The way forward will be determined by how these works operate in a networked culture and the success of their translation to a screen-based context. Also, I think work that will be moving forward will somehow still utilise or explore current technologies, even if it is done in a traditional manner. There seems to be a strong element of the material and the gestural with the works in “Future Process.” Could this be a trend that perhaps signals the artists’ desire generate a stronger connection with the creative process and the physicality of art making? Of course. The works do not just react to social or cultural influences but are also dictated by a conscious recognition of the moments of making. This form of creation allows for errors and can stay true to the material, where sometimes work that uses new technology or commercial objects loses those human nuances. Nicholas McGinnity’s work demonstrates a very direct physical connection between himself and the work, with a lot of his gestures created by the touch of his fingers in the paint, rather than a brush or palette knife. The heavy greys and blacks saturating his canvases add an element of weight to his work that could only be possible with his thick applications of paint. The ensuing textures captured in his paintings allow a viewer to peak at the moments when his physical movements and motions occurred. McGinnity’s works could almost be viewed as a paused performance. What do you want to convey and express with the works in “Future Process”? The overall premise of this exhibition is to demonstrate works that return to the traditions of painting without compromising their conceptual foundations. The artists in this show recognise the importance of new technologies and may respond to these technologies in some way. In-so-doing, they utilise materials or processes that are both very hands-on and rooted in craft but also quite experimental in their own right. Even in a time when technology can be at the forefront of creative and cultural endeavours, and when algorithms can solve problems and attain a certain perfection, the process of using one’s hands to make things again is a very refreshing tool that can drive new creativity. The exhibition also focuses on abstraction as a forerunner of international painting. Bringing new abstraction to the attention of Australian audiences is very important when one can see much proof of its relevance resonating across the rest of the world. 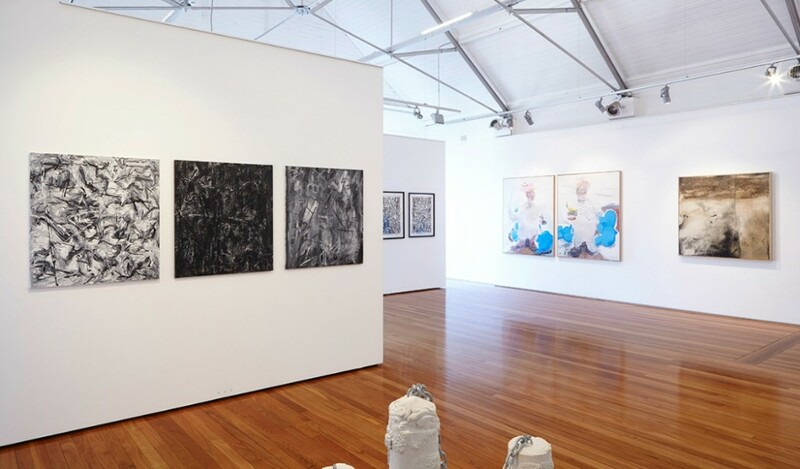 It is sometimes necessary to highlight the quality of abstract painting in Australia, where figurative painting is often more rewarded, especially evident in Australia’s massive painting prize culture. However, the recent successes many artists in “Future Process” are experiencing with local collectors, could be demonstrating a positive shift in how Australian audiences are responding to this new wave of abstraction and process driven painting.